Pramod Abichandani, a longtime professor at Drexel University now at New Jersey Institute of Technology, demonstrates how to use the Aura drone’s gesture-tracking glove controller that he developed. Dozens of toy companies will serve up pint-size drones this holiday season, multi-propeller flying machines that can soar horizontally and vertically, hover in place, and do impressive loop-the-loops. But it's the Aura drone, developed by a Philadelphia-based team trading as Loco Robo Innovations, that's caught the attention of the industry pros at the Toy Insider, landing high on the trade magazine's "Best Tech Toys of 2017" list. "We've never seen anything like KD's latest innovation," said TTI analyst Marissa DiBartolo, putting all the praise on KD Interactive, the U.S. toy company that's helping to bring this flying machine to market — initially at Toys R Us, Target, and Amazon at a "special introductory price" of $79.99. "This is definitely a top tech toy that will bring the entire family together this holiday season," DiBartolo said, "because kids — and kids at heart — will be eager to feel like they are channeling the Force and flying a drone with just a flick of the wrist." The special thrill of the Aura is how easily a person, small or tall, can get it up and running. And there's how difficult it is to make an Aura crash or disappear, thanks to a melding of a motion-sensing hand-worn controller, a sensitively attuned flying machine, and intuitive software that lead inventor Pramod Abichandani calls "Gesturebotics." 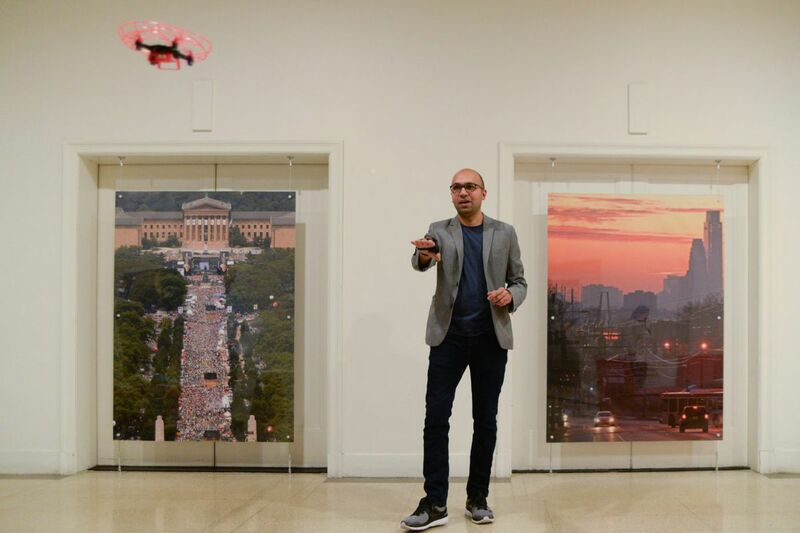 "There's a lot of intelligence in drones and in the Aura as well," said the India-born Abichandani, 33, a former robotics professor at Drexel University now at New Jersey Institute of Technology, who created the project with his former Drexel engineering students and business partners, Kyle Levin and William McIntyre. "But if you look at the barrier of entry for piloting a drone," he said, it's usually in the joysticks — the same hard-to-work, wireless controllers that have steered radio-controlled "vehicles for almost 30 years. Many's the story of a kid opening a box on Christmas morning, going outside and sending the new flying machine up into the air – and it disappears … forever." In large measure, that happens because the fledgling pilot couldn't grasp the concepts of pitch, roll and yaw. "When you bank and turn a drone around, the joystick controls need to be operated in reverse. What was left becomes right, what was forward is now backwards." The controller Pramod Abichandani and his team developed detects hand gestures and movement to direct the Aura drone. Aura's one-size-fits-all remote control and companion brain power in the drone do the reverse engineering for you, mapping commands into a language the robotic toy follows. Strapped on with Velcro, then self-calibrating to your outstretched hand, the "inertial measurement" controller, loaded with sensors, responds to the wearer's simple gestures, with just two buttons for added help. Flip your hand up, and the Aura soars; down, and it dives. Hold steady and straight, so does the drone. Bank the hand left, now bank it right. Want to flip that thing? Press the thumb button. Because the Aura drone is lightweight, modestly powered (with six minutes run time between battery charges), and easily blown off course by wind, it's best used indoors. But it knows to not fly higher than nine or 10 feet, and automatically cuts power and lands if it bumps into anything. Propellers are safeguarded in a pliant polypropylene frame that bends on impact. Aura extends on smarts first deployed in the developers' initial hit project — coding-teaching Loco Robo robots developed for the ed-tech market with $500,000 in first-round funding from DreamIt Ventures, Founder.org, and the New School Ventures Fund. Just a year and a half after that launch, those little bots are being programmed (with a smartphone app or one of four coding languages) by students in "about 300 schools across the U.S.," including Bucks County's Centennial School District and the Agnes Irwin School in Bryn Mawr. Loco Robo Innovations is already "profitable," said its CEO: "We've basically made more than our valuation in the first round." A second round is coming "pretty soon." Diving into the toy industry is not for slow movers or the faint of heart, said the relative newcomer to product development, tooling and factory-order financing. "Santander Bank's been very helpful with the funding," he added. "In November, we had a full spec, started writing the firmware and designing the hardware. Then we went to China, where we started getting into mass manufacturing. If you think about it, this was a really quick turnaround, with several sleepless months. … By May-June, we were shipping." "The Aura is just hitting shelves," said the Fairmount-based inventor, "but we're already deep into the follow-up products KD wants to introduce at the New York Toy Fair in February. With any product made in China, you're sure to get knocked off. So you have to keep evolving. But at least we'll have this holiday to ourselves." The Aura toy drone in flight. It’s best used indoors, because it’s lightweight and easily blown off course by wind.